Hello friends! I hope that you are having a great beginning to your week! Ours is a little rough. We intended to go to the DMV but didn't have all our ducks in a row so we have to push that back yet again. Then we have out that Parker has Stomatitis which is a virus that's leaving sores in his mouth. We can't do anything for him but give him tylenol. Hopefully, he'll be better really soon. Ok, so here's a card I made for CardPatterns sketch 65. It's so funny, because this is my go to sketch! Well, without the buttons that is. 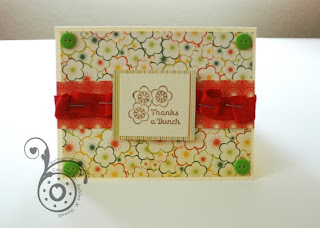 I was talking to my friend JoAnn (who I know outside of stamping, how cool is that?!) and we were talking about this very same sketch before I even saw it. We agreed that it was always a go to. Teehee, isn't that funny? Alright, this card is also for the Unity Addicts challenge over on SCS, to use Unity Stamps and staples on your card. I used Unity/Cosmo Cricket's Garden Variety. The buttons and ribbon are from my stash. Happy Tues everyone! I hope it's fantastic! This is so pretty and love how you used the staples too. So sweet Ashley! Love that paper you used. OH what a lovely card Ashley! Hope Parker will feel better soon. Gargling with warm water with salt helps a lot - I've had quite few times when I was a kid. It will leave a sting but it works!